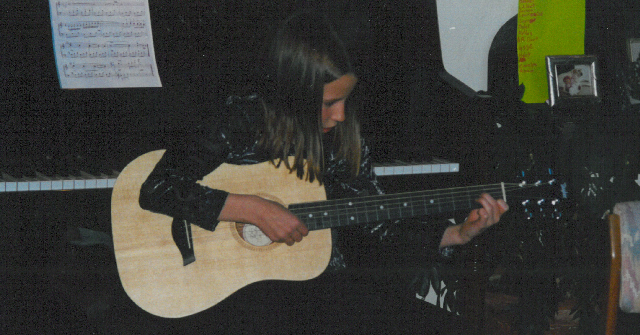 At five years old, Lauren told her parents she wanted to play guitar. The tiny version of a Spanish, classical guitar arrived in the mail next Christmas. Only a few lessons in, however, this toddler was tired of having to spend lessons on form and use a classical footstand every time she played. She gave it up, thinking she had mis-imagined the glorious life of a guitarist. At twelve years old, two years into piano lessons, Lauren had somehow convinced her piano teacher to spend ten… fifteen… twenty minutes each lesson on guitar. It wasn’t long before they spent one entire lesson on guitar and the piano teacher had to remind Lauren that he was almost out of things to teach… maybe it was time she sought a guitar teacher. A year into her guitar lessons Lauren had written a couple songs, stubbornly insisted on carrying her guitar on a five-day backpacking trip, and joined choir at her high school. The following year she had to choose between continuing all her music classes and finishing the intensely academic IB diploma. She chose music; by her senior year Lauren had performed around town, in front of a crowd of six hundred, and written about fifteen songs. 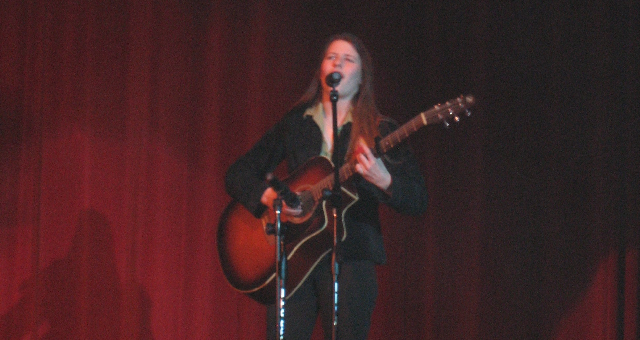 Her freshman year of college Lauren learned to use recording software and techniques so that she would be able to record a full-length original CD. She spent hours in the Marlboro College studio, tweaking things, or learning something new and having to start all over again. She registered and printed her CD in the spring of her freshman year. 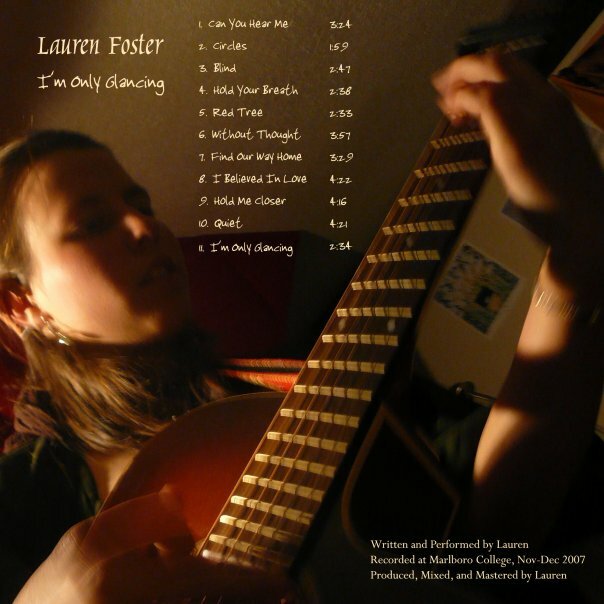 Since then Lauren has performed sporadically all over Colorado- including Palisade, Estes Park, Boulder, and Colorado Springs. 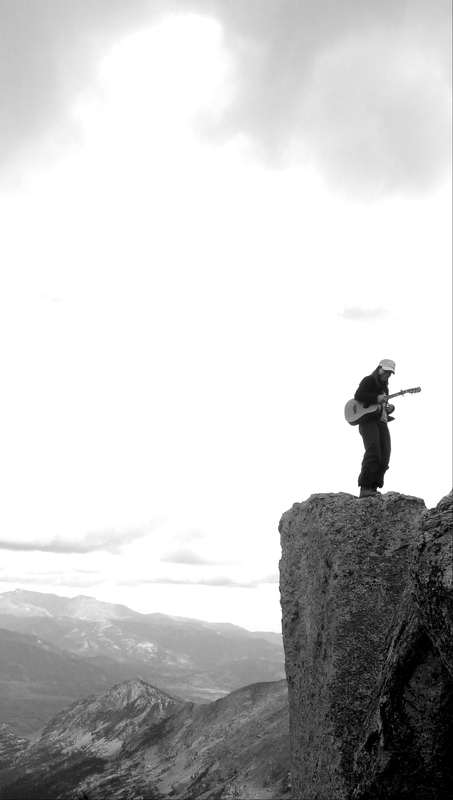 She has played on the top of some of the tallest mountains in the Rockies and carried her music through terrain no guitar had entered before. For her, music is a teaching tool, a continuous learning experience, but above all a healing, emotional process. “Music allows us to experience our flooding emotions through the lens of appreciation. When you’re angry, sad, happy, or overwhelmed it’s easy to lose track of how beautiful the moment is. I write to understand those emotions. I write to celebrate how amazing it is to be able to feel so deeply.” ~Lauren Foster.